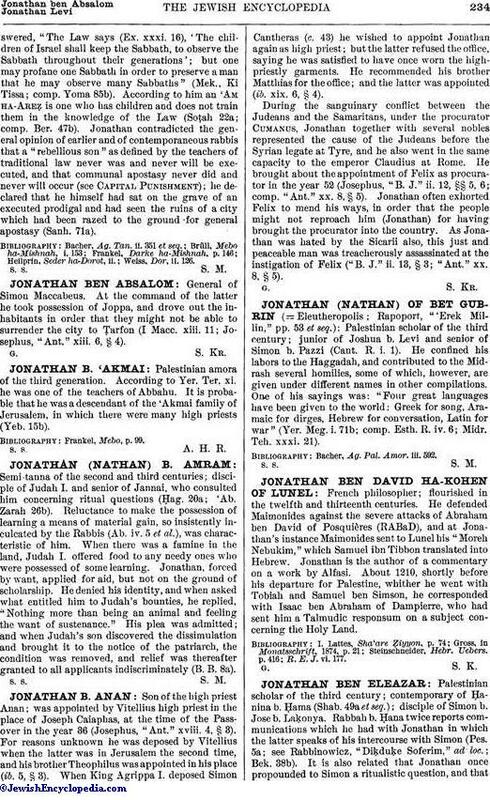 Semi-tanna of the second and third centuries; disciple of Judah I. and senior of Jannai, who consulted him concerning ritual questions (Ḥag. 20a; 'Ab. Zarah 26b). Reluctance to make the possession of learning a means of material gain, so insistently inculcated by the Rabbis (Ab. iv. 5 et al. ), was characteristic of him. When there was a famine in the land, Judah I. offered food to any needy ones who were possessed of some learning. Jonathan, forced by want, applied for aid, but not on the ground of scholarship. He denied his identity, and when asked what entitled him to Judah's bounties, he replied, "Nothing more than being an animal and feeling the want of sustenance." His plea was admitted; and when Judah's son discovered the dissimulation and brought it to the notice of the patriarch, the condition was removed, and relief was thereafter granted to all applicants indiscriminately (B. B. 8a).